Wind turbine blades follow the same physical fact of the aircraft wings, this is the lift force generated by the difference in pressure between both sides of the wing/blade. The curvature of a wing is such that the air speed over the upper side is higher than the air speed over the lower side. This creates a pressure difference that 'pushes' the structure upwards holding the aircraft in the air. If we rotate the wing to make it vertical, the lift force creates a rotating movement (torque) making the wind turbine rotor spin. If the angle of attack is low, passing air flow over the blade is attached to the blade's surface. Given the shape of the blade, air speed on the upper side is higher than in the lower one (pressure is lower in the upper side), creating an ascending lift force (rotational in the case of a turbine). When the angle of attack increases (when wind speed rises), air flow on the upper side of the blade begins to separate from the surface creating a turbulence that inverts the flow direction in that part of the blade. When this happens, air speed through the upper side of the blade drops suddenly causing the pressure to increase and minimizing the pressure difference that causes the lift. In this case, the rotational force falls and the turbine rotor slows down. 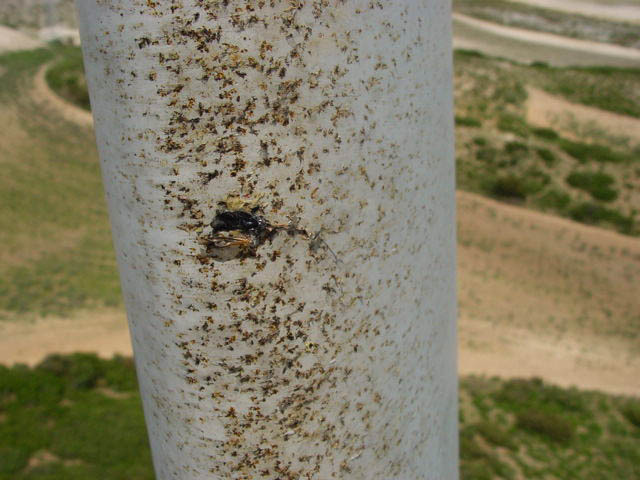 The results of the case study carried out in Magallon 26 wind farm in Zaragoza, Spain, identified a beetle as the main contributor to the accumulation of insect debris on the blades. This flying beetle is Omophlus lepturoides, a species that feeds from the shrub roots and lives underground until the eclosion. From this moment the beetle lives for a period of one week, feels attracted by bright colors (white) and flies on low wind conditions ascending up to a few dozens of meters. As the image shows, it has two orange thick elitra (wing covers). When this beetle collides with the rotating blades it produces severe rugosity on the blade. 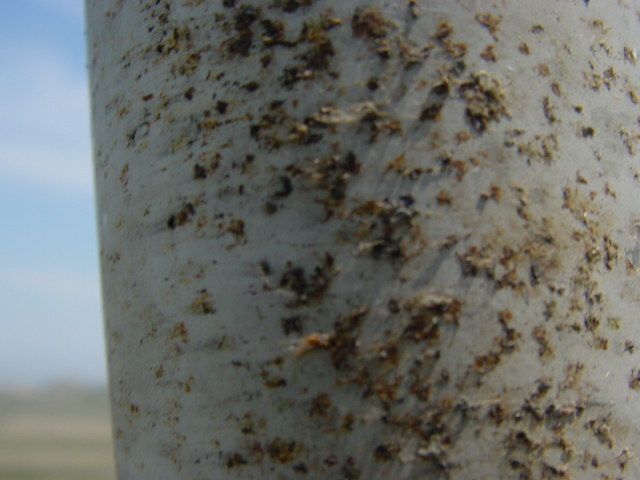 The constant accumulation of rest of these insects on the leading edge of the blades contributes severely to the double stall effect. Stall is referred to as the loss of lift force of a blade due to changes in its aerodynamic behavior. This is the same effect that suffers an aircraft when airspeed is too low, the wing lift force decreases and the aircraft stalls. In the case of Pitch controlled wind turbines, stall is induced by the rotation of the blade over its axis. In Stall controlled turbines, the design of the blade produces a progressive stall effect over a certain wind speed maintaining the torque on the rotor as the airspeed increases. In this scenario, the design of the blade plays a critical role on the power output and stability of the turbine. The power curve is the representation of the power output of a given turbine at any wind speed and it is unique to that turbine. If no aerodynamic loss (stall) were present, the power output (rotor speed) would increase with no limit, causing mechanical and structural failure on the turbine. The key to maximize performance is to design a turbine with a power curve as steepest as possible on the ascending part of the plot (more power output at low wind speeds) and as flat as possible past the maximum power output. This is a typical phenomenon of stall controlled turbines although it also occurs on pitch controlled turbines. Double stall is referred to as a second and unpredicted aerodynamic loss in the blade, not related to the blade design and that produces a decrease in the energy that is extracted from the wind by the rotor. There are several factors that may cause double stall. These can be a malfunction in the yaw system, a faulty blade design or the accumulation of insects, ice, oil, dust or salt on the leading edge of the blade. In any case, the result is the modification of the aerodynamic profile of the blade producing a poorer transformation of the energy of the wind into torque. 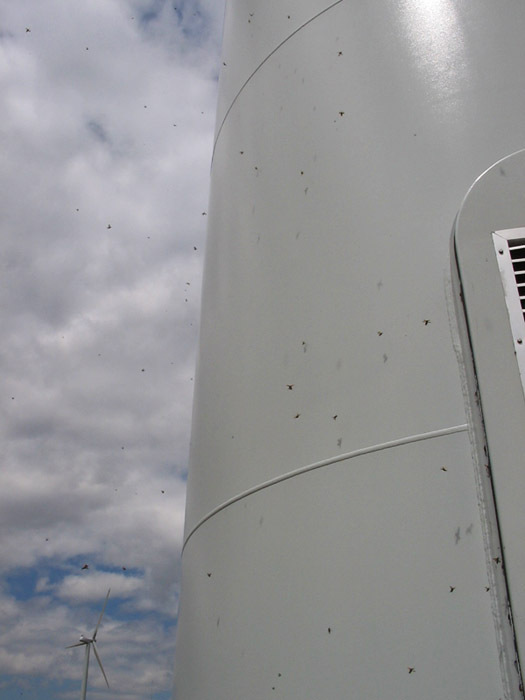 The effect of insect debris accumulation in the blades has been under study since 2004 in Magallon 26 wind farm (10.8 MW) in Zaragoza, Spain. 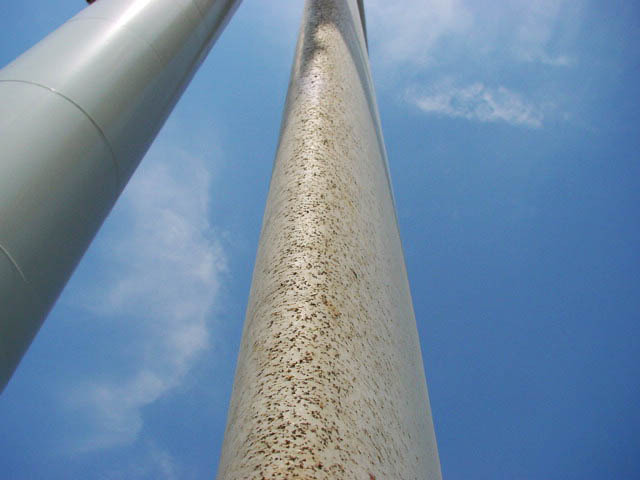 The owner of the wind farm developed in 2005 the Blade Cleaning system and was installed in every turbine. Therefore, assuming a 10% annual average power loss on the power curve, production can fall up to a quarter of a GWh per year (equivalent to the annual consumption of 71 households) and a revenue loss of 20,000 € per year. The implications of the double stall phenomenon not only affect the expected revenue of the wind farm but also the National Grid system as the predictions of power output are less accurate. Besides, the increasing mismatch between expected and actual production may convey sanctions from the grid operator.